Sumner Davis was born on March 18, 1924, in Burbank, California, and died on December 31, 2008, at a care facility in El Cerrito, California, after a brief illness. He is survived by his beloved wife, Robin Free. His first wife, Grace Davis, died in 1989. Davis is fondly remembered by students, faculty, and staff as a great scientist, an exceptional teacher, and a kind colleague and friend. Davis started college during World War II. After just one semester at the University of California, Los Angeles (UCLA), he was inducted into the Army Air Corps and set upon a very different course. While still in the Army, he attended Pomona College and started studying to become a meteorologist. He soon switched to electronics and radio, eventually attending Yale University and Harvard University before graduating from the famed Radar School at the Massachusetts Institute of Technology (MIT). Following the war, he left the Army and finished his A.B. in physics at UCLA in 1947. From there, Davis went on to the University of Illinois, where he received his master’s degree in 1948. He promptly entered graduate school at the University of California, Berkeley, where he earned his Ph.D. in 1952 for work with Professor Francis A. Jenkins, using measurements of atomic spectra to determine the nuclear spins of selenium isotopes. He returned to MIT as an instructor in 1952 and became a member of the MIT research staff in 1955. Then in 1959, he returned to UC Berkeley to teach spectroscopy. 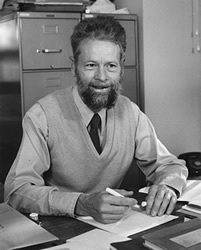 He joined the physics faculty in 1960, and became a full professor in 1967. He renewed his association with the military in the 1970s, serving on the Chancellor's Advisory Committee on ROTC, as its Chair from 1972 to 1976. Cal was his home until his final retirement in 2004. Davis’s research life was devoted to the precise measurement of light emitted by molecules found in the sun and distant stars. He worked initially with UC Berkeley astronomer John G. Phillips in studying the spectra of two-atom (diatomic) molecules. Among the molecules Davis discovered or cataloged in the laboratory, in stars or in the sun were C2, FeH, CS, SH and SiC2. He wrote a technical monograph, Diffraction Grating Spectrographs (1970), as well as other books on CN and C2 spectra. In 1976, Davis’s research interest moved into Fourier transform spectroscopy. He would often gather data at the National Solar Observatory at Kitt Peak, near Tucson, Arizona, and bring them back to Berkeley to analyze. He coauthored a book, Fourier Transform Spectrometry (2001), with Mark C. Abrams and the late James Brault. Davis was a natural-born teacher. He supervised 36 Ph.D. students and taught many undergraduates, both majors and non-majors. He was given the Academic Senate’s Distinguished Teaching Award in 1980 because, as Chairman J. David Jackson said in his nominating letter at the time, “He is a warm, self-effacing, dedicated teacher with a real concern not only for the subject matter, but the most effective way of presenting it. He is ever conscious of physics being a demanding subject that often intimidates the beginner. He works hard and effectively at dealing with students’ difficulties.” Indeed, many of his former students who supported this nomination told how their classes with Davis were pivotal experiences, not only in their scientific education but also in the formation of their skills as problem solvers and critical thinkers. After his first retirement in 1993, upon which he was awarded the Berkeley Citation, Davis returned to the Department of Physics to direct the 111 Lab, the upper division physics teaching laboratory that helps students apply physics to the real world. He was considered the heart and soul of the 111 Lab, and the instructional videos in which he starred are still shown to students today. Davis was an accomplished glider pilot and flew around the West into his 80s. National Geographic magazine featured a picture of him and his glider after he achieved an altitude record of 10,000-plus feet over Arizona. As recently as 2000, he served as president of the Pacific Soaring Council, Inc. He was also an oboist and enjoyed hosting weekly chamber music group sessions in his home. His passion for music and insatiable curiosity met when he decided to build himself—from scratch—a harpsichord, with great success. Scholarly accomplishments aside, Sumner P. Davis will be remembered best as an inspiring teacher who taught his students to persevere, to look for answers and to resolve even the most challenging problems. Sumner also took great pride in his Basenji show dogs, which spent many days in his office and enjoyed runs on Memorial Glade. His warmth and kindness were felt by all who came into contact with him in the physics department, as proved by the trail of teddy bears and stuffed animals he left behind. Privately, his faith informed his actions, and it carried him and his wife, Robin, through life and through his last days.